Houston, we have a … winner! This spring we teamed up with NASA’s Ames Research Center in Moffett Field, California, and Teachers in Space to pose the NASA Make: Challenge, a do-it-yourself technology and education space competition that proved to be a very tall order. We asked our community of makers, and space enthusiasts more generally, to come up with an experiment that could fit inside a 10x10x10-centimeter cube, be buildable by a team of high school students with access to typical tools–nothing too out-of-the-ordinary — while also demonstrating something interesting about suborbital conditions, folding in some illustrations of sound science, technology, engineering and math (STEM) principles, and do it all with under $200 (we called it a “bake sale” budget). Oh, and we gave you just about six weeks to do it. With such constraints, at times it felt as if we were resurrecting the entrepreneurial ingenuity of the Apollo era. 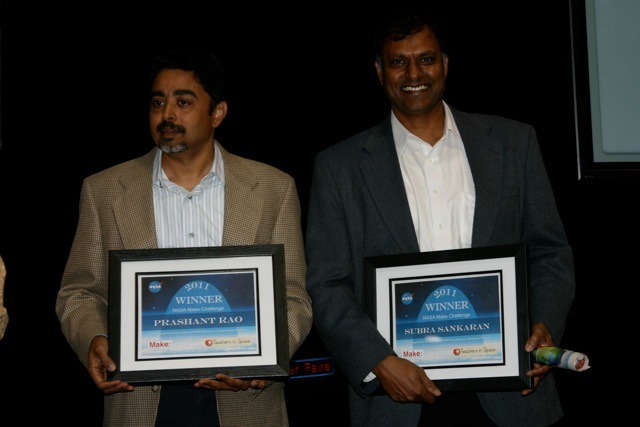 Two inventor-engineers from Houston, Texas, came up with the most clever and versatile proposal, and so we are pleased to introduce you to the winners of our first NASA Make: Challenge, Prashant Rao and Subra Sankaran. Prashant and Subra’s winning proposal, “Bring It Back,” describes a small and inexpensive microgravity spaceflight kit designed to conduct three experiments. The experiments demonstrate fluid dynamics in suborbital flight in contrast to what happens back here on the surface of the earth. The kit’s design uses the melting and hardening of paraffin to capture qualitative differences in the environments. 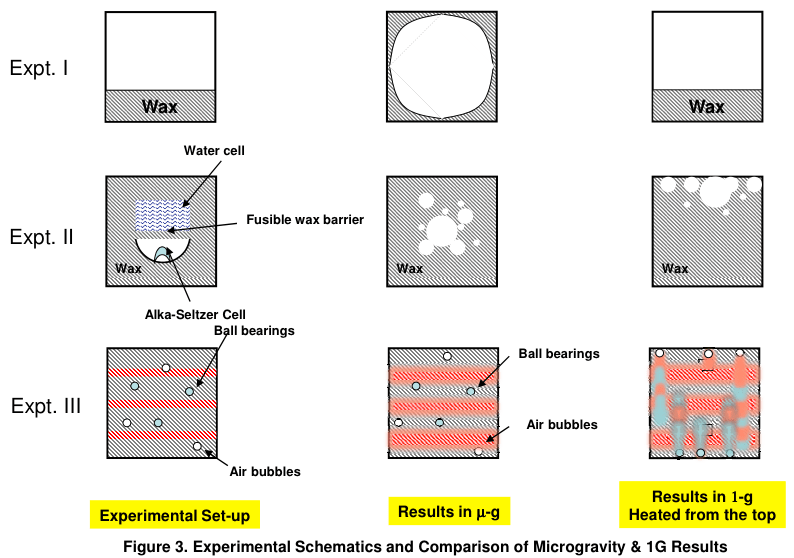 We imagine that the results might spark many other classroom conversations about how the rules of physics change in microgravity — not to mention the possible effects on living and non-living systems (like the human body!) that run on liquids. The investigation could illustrate science and math processes and principles from middle school through post graduate work. The experiments could conceivably produce other data on parabolic flights and longer stints on the International Space Station. We announced the challenge here on MAKE and through NASA’s press office, and in addition over 18000 educators and thousands more readers of other blogs learned of the contest, but in the end we could have only one winner. The team’s efforts garnered them our top prize: a trip to NASA’s Ames Research Center and Maker Faire a few weeks ago. Sankaran and Rao were honored onstage on Saturday, May 21 at the Bay Area Maker Faire in San Mateo, Calif.
And see part of their proposal at Make: Projects. Dr. Subramanian Sankaran has extensive research experience and publications in boiling heat transfer, centering on fundamental questions in steady and transient flow and pool boiling problems. With a background interest in enhanced heat transfer, Dr. Sankaran conducted his post-doctoral research on multi-disciplinary fluid flow mechanisms of electro- hydrodynamics, which are applicable to small scale and space environments. His post-doctoral research work extended into a NASA space shuttle science experiment in 1996 aboard Columbia-STS-78. His role in the successful tests aboard the DC9 zero-gravity plane for the above experiment, his later roles as the Deputy Fluids Facility Scientist for the International Space Station fluids facility (FCF), and Deputy Project Scientist for the Physics of Colloids in Space (PCS1) experiment, and Project Scientist for the Physics of Colloids in Space (PCS2) experiments have augmented his background in fluids in space. In 2004, NASA awarded him a Silver Snoopy Award for his role in the series of colloids experiments in space. In 2006, he joined MEIT/Jacobs/ESCG group at NASA JSC to work at the interface between science and technology — in the past few years, he has applied his overall experience to help develop several ideas for human space exploration, and space hardware such as the potable water dispenser in the International Space Station. He has had an avid interest for education outreach throughout his career and has participated in various activities such as National Engineers week, Mission to Malls, dropping in microgravity, NASA scholars, solar cars, CCISD and SEFH science fair judging work, and so on. Dr. Prashant Rao is a Mechanical & Aerospace engineer by training and a space nut by inclination. After a brief one-year foray into the HVAC industry as a sales engineer, he shifted gears to conduct research on algorithms to control flow separation over wing surfaces, all in a quest for super-maneuverable aircraft. Back on the ground he helped develop industry specific toolboxes for the multibody dynamics software ADAMS. He then brought his analytical skills to bear on the automotive industry helping industry leaders in the U.S and Asia use the software to develop methods to model and analyze the behavior of ground vehicles to improve handling, ride quality and durability. He has particularly enjoyed using statistical Design of Experiments to develop a deep insight into the workings of complex engineering systems. In 2009 he joined the Barrios/Jacobs/ESC group at NASA JSC as a Principal Engineer to work on mechanism analysis and structures. He is currently working on the Orion program Crew Module hatch mechanisms to assure emergency egress capabilities. He is also using simulations to put the Crew Module – Service Module separation mechanism through its paces for its various mission scenarios. Dr. Rao is also an entrepreneur endeavoring to bring to market new technologies in automotive engineering. Dr. Rao enjoys spending time with his wife and two children, jogging and birding when time permits, and getting kids excited about science through his role as volunteer science fair judge for Houston area school districts. He harbors an as yet unfulfilled desire to work on SETI some day.